This article is dedicated to the unnamed Royal Blue and Magenta Betta that tragically died of a protozonine illness and to Dexter, the red betta that inspired this article. If you have read much about betta genetics, it is likely you have heard that some reds don’t stay that way. If you’re like me, the mystery of this statement interests you. Well, recently I purchased just such a creature and this is that story. I ran to the store grabbing a bottle of copper safe and every other med I could find. My new fish was almost white a dramatic change from the bold royal blue he once was. On return from the shop, to my horror, he was dead. I carefully packed him away in a plastic bag; the pet shop was going to here from me about this! I headed over to the store and handed him to the lady at the front desk. Her reaction of “yah, sometimes that happens”, was not what I wanted to hear, but I took the 50% off coupon and wandered over to the betta tanks anyways. Their they where, fresh in from the farm, all solid red. I dislike solid colored bettas, particularly red, but one was in the tank that had fresh water pouring in it. I decided that even though I couldn’t save my first fish, this one I would. Besides, he wasn’t solid red. not really; the tip of his tail was black. As soon as I was home he was given the name Dexter, after all, the last one died and I didn’t have a name for him yet. I didn’t want that to happen a gain. Dexter took the ride back to school in stride and proceeded to flare at me when he was added to his tank. “Good” I thought, he is healthy. Over they next few days Dexter proceeded to be ticked off at everything around him. Before long we had established a two betta biogold pellet twice a day routine. He learned to follow my finger in order to quickly find the pellets caught in the bubblers current. Dexter seemed happy, I was happy. but something very strange was happening. Dexter was changing color! It began with his head, it started to become an opaque white then it darkened into a very deep crimson. As I watched this happen, his body began to gain a turquoise tinge. By the time the week was over he had three bands of color running horizontally along his body. The uppermost band deepened to royal blue, the middle band became nearly grass green, but with a tinge of turquoise still intact and his belly, that remained a soft red with a turquoise iridescent! By the time the bands of color had become notable, his black tipped tail had turned navy blue, and the edges of his fins (where they attack to the body) began to change color too. The closest area to the body is turquoise with a yellow iridescent, it slowly morphs into a grass green, then into turquoise again and finally into his original red coloring! Each day the fin’s color creeps higher, how is this possible?! 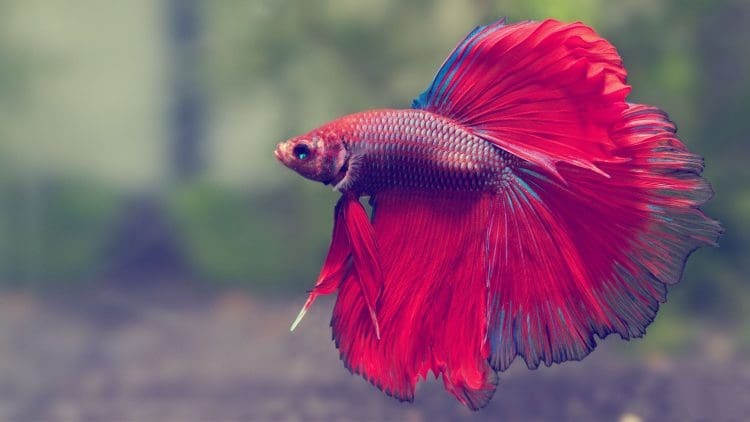 Red is a true pigment in betta fish, all other colors except black are made by the body from the food the fish is eating. The healthier the fish, the more it puts into its colors and the bolder it’s pigment becomes. Dexter was not a happy fish when I got him, he didn’t have the room or the food to create his genetically defined excess food crystal colors, so all that was seen was the underlying red. His head and Body darkened from health and his color crystals continue to creep up his fins. Dexter like many red fish , was actually a multicolor in disguise. So next time you see that sad little red with a fleck of color here or their, take a chance and pick him up, you never know what he may grow into! so cool! I found this amazing! Wow! I had no idea bettas were like this! The more I learn, the more I love and am fascinated with them.